Just recently I noticed the battery going dead in one of my vehicles. The desert is brutal on batteries and their lifespans aren’t as long as elsewhere. When batteries die, there often is little to no warning. If you aren’t prepared, you’ll need to get a jump start to get to the auto parts store if nothing else. Today I have an answer for that. Yes, there will be a link to buy it on Amazon from which I receive a tiny commission. I have purchased this product myself and did not receive it for free. So you need to jump start your car and there are several things you need. First, you have to carry jumper cables or find someone else carrying them. Next, you need another car with a strong battery. Then you have to align the two vehicles so that the cables can reach from one car to another. That last part is often the most difficult since one car won’t start. What if it is late at night and you don’t want to approach a stranger? What if you are in a remote location where there simply isn’t anyone around? 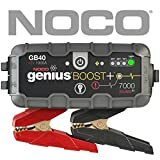 That’s where the NOCO Genius Boost Plus can save the day! It is a battery pack that you carry in your vehicle and it contains enough power to give your vehicle a jump start. Now you don’t need the help of others to get your car started. It even comes with a small bag so that you can keep it in your trunk or other storage area. Before you get stranded, get a Genius Boost for your vehicle!